Victory Farm near Braymer, Missouri is nestled in the heart of the United States. We are home to more than 200 paco-vicuñas. This new and upcoming camelid breed is set apart by their superior fiber and majestic appearance. Their unique personalities have endeared them to our hearts as our lives have been enriched by this new and exciting adventure. Athena, the matriarch of our herd, graces us daily with her beauty and regal splendor. 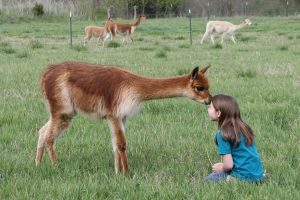 The paco-vicuña breed began in 2002 and now numbers over 600 across the United States. Victory Farm specializes in paco-vicuñas and is dedicated to their development and promotion. 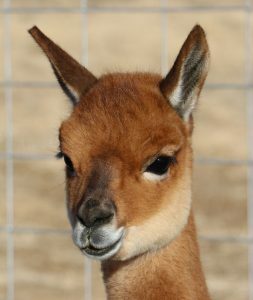 Victory Farm is excited to share our paco-vicuñas with you through this website. Please browse our photo galleries and contact us if you want more information or would like to visit our farm to see these animals up close and in person. They are truly a breed set apart. These animals produce some of the finest fiber in the world. It is like touching a cloud, as many spinners describe it. Only a limited supply of this fiber is available. People from as far away as Europe and Australia are starting to get their hands on the wonderful paco-vicuna roving and yarn. The knitter, spinner and felter are all excited about this new luxury fiber. Paco-vicuña owners enjoy the vigor and unique personalities they find with these very special animals. One look into their big beautiful eyes and it is “love at first sight”. A work in progress. We appreciate your patience!